Scott Berfas and Jack O’Connor of Newmark Knight Frank and CIBS president David Leviton. Old Bethpage, NY The Association for a Better Long Island (ABLI) and the Commercial Industrial Brokers Society (CIBS) presented the Long Island real industry’s awards on April 10th. The Most Ingenious Deal of the Year Award was shared by brokers with Newmark Knight Frank and Cushman & Wakefield for Haugland Group’s $12 million purchase of 336 South Service Rd. in Melville, a 43,600 s/f industrial property on six acres once occupied by Nikon that has been converted to offices. Haughland plans to consolidate facilities in Plainview and Patchouge in Melville. The award was presented to Scott Berfas, a managing director at Newmark, Jack O’Conner, executive managing director at Newmark, David Pennetta, executive director at Cushman, and Kyle Burkhardt, a senior director at Cushman. 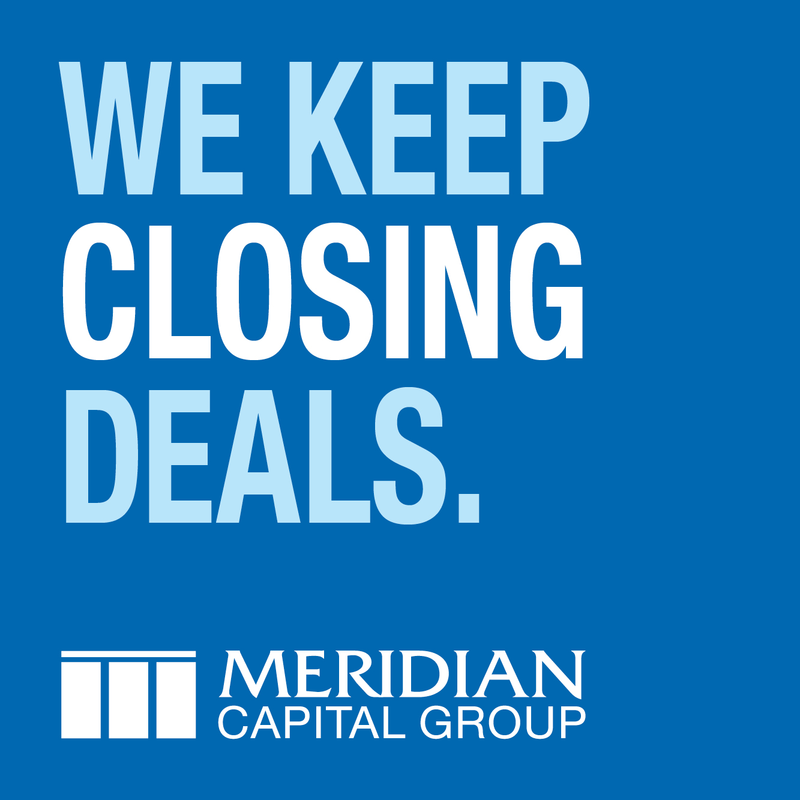 O’Connor and Berfas represented Haugland in the Melville purchase and are also marketing the company’s Plainview building, while Pennetta and Burkhardt represented the seller, Jericho-based Harvest Real Estate. 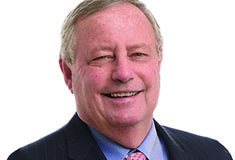 The Newmark brokers searched for more than a year for a corporate headquarters for Haugland, which wanted to be closer to New York City, but a lack of product resulted in the selection of the Melville location ideal, according to O’Connor. Harvest had pitched the property, unsuccessfully, for redevelopment as a multi-story office building. Alexandra Damianos, John Finn, ABLI president Laureen Harris and Cris Damianos. 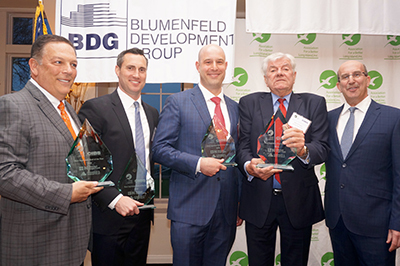 The Developer of the Year Award, meanwhile, was presented to Daminanos Realty Group, of Smithtown, for its purchase and renovation of 1377 Motor Pkwy, in Islandia, Damianos spent $12 million on extensive renovations to the 170,00 s/f office building, which was acquired in 2015. Renovations were completed last year and the then near-empty building now is 96 percent leased. 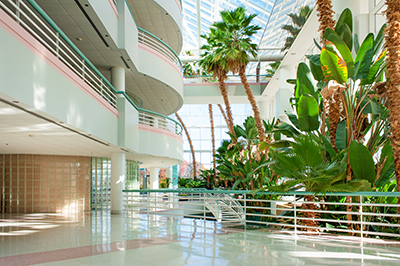 The four-story class A office building also known as Islandia Pavillion was designed by the Spector Group and originally built in 1989. 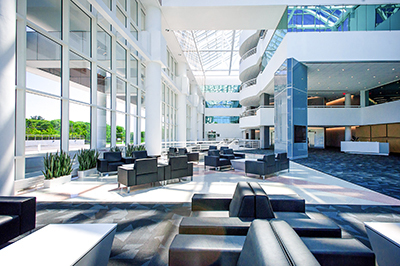 It features a fitness center, full service café, conference facilities and covered parking. Damianos contracted with James Acunto of Hauppauge-based Innersite Interior Design to redesign the building’s lobby, according to a company statement. Damianos also plans other improvements includied a new roof and upgrades to mechanical equipment, bathrooms, hallways, elevators, landscaping and the parking lot on the 8-acre site. 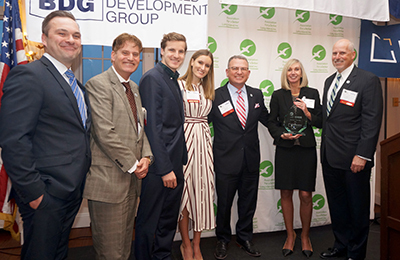 The awards were announced April 10th, at the annual gala dinner of the ABLI and CIBS, which brought together hundreds of Long Island regional real estate industry leaders and professionals at the Heritage Club in Bethpage State Park.